Unscripted video, "The SFHS Difference: Teacher Edition." in the newest edition of "The Spartan Project." Our dynamic Catholic high school attracts bright, spirited young people who are academically motivated and participate in all facets of their high school experience. St. Francis High School provides a fantastic opportunity for students to grow academically as well as personally through their healthy involvement in clubs, the arts, athletics, service, and campus ministry. We strive to elevate students to be the best version of themselves. And we believe respecting individuals in a supportive, challenging environment is a responsible way to prepare our students for college. Today, we believe our most profound challenge as educators is genuinely meeting the needs of young men and women on their path to success. St. Francis High School is proud of our excellent college preparatory tradition as well as the spirit of our school. Our culture rewards hard work as well as achievement. We respect students as individuals. Our community spirit is distinctive, Franciscan, genuine, and not easily imitated. At St. Francis High School, community is not a soft perk but a concrete advantage of our college preparatory path. This is the St. Francis High School we see every day, where minds and spirits thrive inside the classroom as well as on the stage and field. We invite you to experience St. Francis High School in person. Visit us, walk our hallways, shadow our students, and meet our dedicated teachers and staff during any school day or at one of our open houses. Please call (630) 668-5800 x 1120 for further information. Studies show Catholic high school graduates enjoy a host of successes, including higher lifetime wages and a firm foundation in personal discipline. Applying for admission to a Catholic high school is simple. Here is an overview for first-time parents. Entrance Exam: Catholic high schools test prospective students for admission. December 1, 2018, is the test date for all Catholic high schools in the Diocese of Joliet. For particular details, check a school’s website. High School Placement Test (HSPT): This is the name of the test, which uses multiple-choice questions to assess baseline academic performance of 8th graders. The HSPT measures in the cognitive and basic skills areas of verbal and quantitative skills, reading, mathematics, and language. A high school will usually offer preferred admittance (and possibly scholarships) to students who test at the school. To determine admission, schools review test results, middle school records, and the student’s application. The exam takes about four hours, including one break. Schools charge a small fee and do not allow calculators. Admissions Events: Catholic high schools hold multiple events to encourage visits and help families get to know the school. Typically, students shadow for a day at the high school and attend an open house. Check websites for details and to register for unique opportunities, such as Middle School Nights and Coffees. Shadow Visits (students): Students go through the high school day with a student host. Open Houses (students and parents): Families visit the school and departments, learn about opportunities, and meet staff and students. Individual Tours and Meetings (parents): Parents may tour a school on an individual basis. The Application: Students apply online to the high school of choice. The application registers you for the test. Schools require a small application fee and your child’s 7th grade report card. Catholic high schools admit non-Catholic and Catholic students as well as students from public and Catholic grade schools and homeschools. Test Prep: The middle school curriculum prepares students for the test, which assesses 8th grade abilities, however becoming familiar with test format helps students to work efficiently. Many high schools use test results (along with subject placement tests) to determine freshman year class schedules. Besides 8th grade coursework, here are additional ways some students choose to prepare for the HSPT. HSPT Test Prep Class: Some students take a formal test prep class. Any facility or tutor that prepares students for the SAT or ACT should also prep students for the HSPT. HSPT Prep Book: Students can purchase test prep guides for home study. In addition, online searches list sample questions. 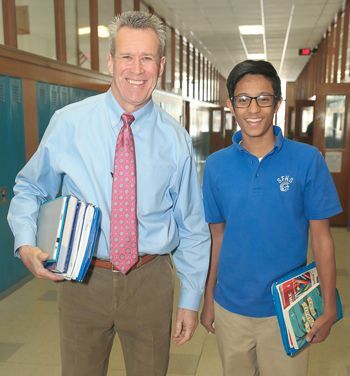 Middle School Prep: Some Catholic middle schools prepare students in school. High schools communicate results in January, then invite accepted students to a February class event. Many families see the high school discernment and testing process as a valuable frame of reference for a future college search process. For further information, contact St. Francis High School. Welcome: "Our Spirit Is Franciscan, Which Translates to Care and Success"
Welcome: "Don't Let Fear Drive Your High School Decision"
Welcome: "Three Reasons to Make Mindful Decisions When Choosing a High School"
Welcome: "To See a High School through College Eyes, Read the School Profile"
Welcome: "Look for High School Opportunity that Leads to College Choices"
Welcome: "Let Peace and Courage Help You Find Your Best School Fit"
Welcome: " Which High School? Seven Steps to Discard the Hype and Decide for Yourself"
Welcome: "Destination College: How to Spot Excellent Prep for Best College Placement"
Welcome: "Hope, Advent, and a Parent's Heart"
Welcome: Look for "School Culture Key to Finding Best School Fit"
Welcome: Look for "Mirror, Mirror, on the Wall, Why Is the Entrance Exam Not Scary at All?" High Schools that Change Lives? You Bet! Only at SFHS: Classroom Spotlight for Parents - Introducing Introducing "Rock Band"
Only at SFHS: This Summer Vacation-We Went on a Service Trip!